Mutations in cytoskeletal proteins have been shown to play a critical role in the pathogenesis of human cardiac and skeletal myopathies. 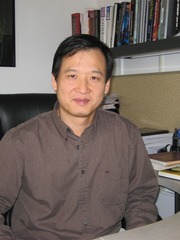 A major focus of the Chen lab is to understand mechanisms by which mutations in cytoskeletal proteins cause myopathy by utilizing genetically engineered mouse models, human induced pluripotent stem cells (iPSCs) from human patients, physiological measurements, and a range of molecular and cell biological techniques. Another major focus of the lab is the study of signaling pathways underlying cardiac hypertrophy and heart failure. Dr. Chen received his Ph.D. in Molecular/Human Genetics from Indiana University Medical School in 1994, followed by a postdoctoral fellowship at UCSD in the Department of Medicine. He joined the faculty of the Department of Medicine at the University of California, San Diego in 1998 and is currently a Professor of Medicine at UC San Diego He is the incumbent of the AHA Endowed Chair and is the Director of Basic Cardiac Research.